Selecting item/value from drop down is needed in android software app as most of the apps contain drop down. Earlier we learnt how to select value from spinner in android appium software test which is opening in direct list in THIS POST. Now let's see another example of how to select value from drop down list which is opening in popup. We will use API Demos software app in this drop down item selection test. Our main aim is to click on drop down to open items list popup and then selecting one item from list as shown in bellow image. You can view above screen from API Demos software app's Home -> Views -> Controls -> 2. Dark Theme. -> Tap on Drop Down. I have created very simple appium android drop down item selection software automation test. Create bellow given test in eclipse. // Scroll till element which contains "Views" text If It Is not visible on screen. // Scroll till element which contains "Controls" text If It Is not visible on screen. // Scroll till element which contains "2. Dark Theme" text If It Is not visible on screen. // Click on 2. Dark Theme. // Typing in text box using sendKeys command. //Click on dropdown to open list. //Select item "Mars" from drop down list. Run above test in eclipse using appium and testng and observe test execution. 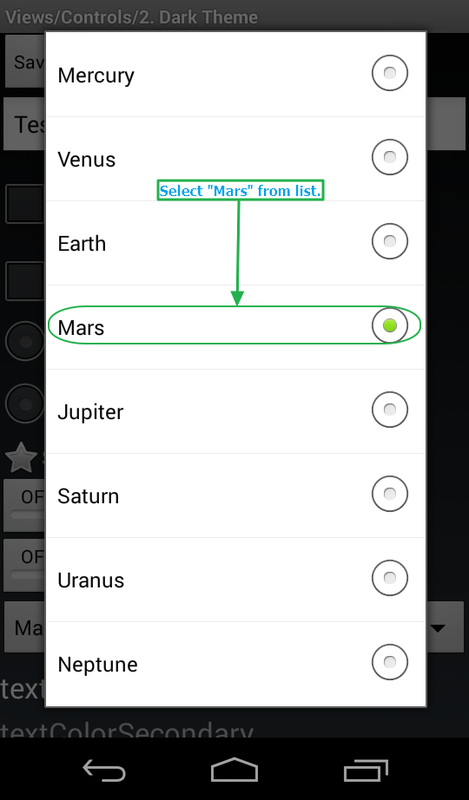 Last syntax will select item "Mars" from list items. 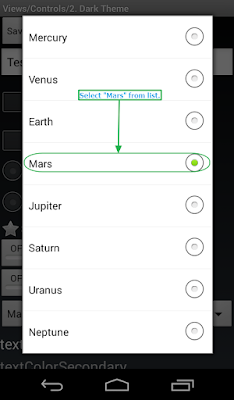 This way you can select value from android software app's drop down list in appium test. Hello, thanks for all your help by these blogs, but some of the example using "scrollTo" function, but scrollTo is deprecated, can you please update code, so it would be easy for beginners to get help from your blogs. Hopefully author must be working on updating the scripts as most of the methods are depreciated. hello please mention syntax of get drop-down list and click on any of the drop-down list name. first thing remember that click on drop-down using coding but next step is not able to get inspect, so how can manage this things. Plz give solution on that.